A restored Stoa in Athens. Stoicism, one of the three major schools of Hellenistic philosphy, was founded in Athens in 308 B.C.E. by Zeno of Citium (334-262 B.C.E.) and further developed by his two successors, Cleanthes (331-232 B.C.E.) and Chrysippus (c. 280-206 B.C.E.). The school got its name from the “stoa poikile,” a painted colonnade in the Agora of Athens where Zeno of Citium gave his discourses. Stoicism grew out of the teachings of the Cynics, and taught that true happiness is achieved through the use of reason to understand events taking place around us and to separate from harmful and destructive emotions. A Stoic learned to practice self-discipline in order to grow in wisdom and virtue. Stoics believed that the universe was imbued with a divine will, or natural law, and that living in accordance with it was eudaimonia (“flourishing,” an ideal life). Students were encouraged to distance themselves from the concerns of ordinary society, while at the same time improving it through their service and example. The Stoic school flourished in Greece and Rome for almost five centuries, until its decline in the second century C.E. A second phase of the school, Middle Stoicism, developed at Rhodes under Panaetius (c. 185-110 B.C.E.) and Posidonius (c. 135-50 B.C.E. ), who broadened the strict doctrines of the earlier Stoics. A large number of works survive from a third stage, Roman Stoicism, which focused largely on ethics. Its proponents include the younger Seneca (c. 1-65 C.E. ), Epictetus (c. 55-135 C.E. ), and Marcus Aurelius (121-180 C.E.). The early Stoics provided a unified account of the world, consisting of formal logic, corporealistic physics and naturalistic ethics. Later Stoics focused on ethics, and progression towards living in harmony with the universe, over which one has no direct control. This is evident in the works of Epitectus, Cicero (an eclectic who shared many of the moral tenets of Stoicism), Seneca the Younger, Marcus Aurelius, Cato the Younger and Dio Chrysostum. Stoic ideas had an influence on early Christianity, and on the thought of many later Western philosophers, who were particularly interested by Stoic theory of logic. Stoicism, which acknowledged the value of each individual, also played a role in the development of democratic government. 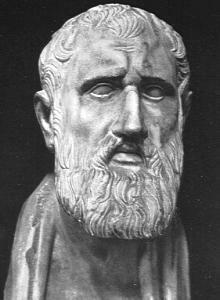 The Stoic school was founded by Zeno of Citium (334-262 B.C.E.) in Athens, Greece, around 308 B.C.E. After studying under Crates the Cynic and several other Athenian philosophers, Zeno developed his own system of thought and began teaching in the Agora of Athens at the stoa poikile (Painted Colonnade), from which the school takes its name. Upon his death in 262 B.C.E., he was succeeded by his disciple Cleanthes (331-232 B.C.E. ), and then by Chrysippus (c. 280-c. 206 B.C.E.). Chrysippus was a prolific writer, and is credited with organizing and developing the teachings of Stoicism into the form in which it continued for the next four centuries. Except for a short “Hymn to Zeus” by Cleanthes, only fragments of the written works of the early Stoics are preserved. In the first century C.E., Flavius Arrian (c. 86–160 C.E.) composed two books, Discourses and Handbook, based on the teachings of the Greek Stoic Epictetus (55 -135 C.E.). These works clearly explain the Stoic system of ethics and lay out a detailed course of exercises in self-examination and self-discipline to be followed by anyone striving to become a Stoic. The power of Stoic thought is evident in the writings of Cicero (106-43 B.C.E.) 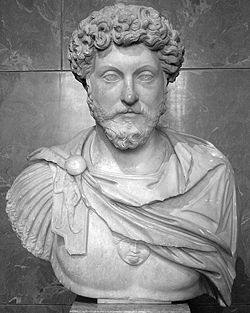 and of the Emperor Marcus Aurelius (121-180 B.C.E. ), who both applied Stoic theory to political life. The Stoic school declined and disappeared with the fall of the Roman Empire and the rise of Christianity. However, aspects of Stoicism have continued to be part of Western thought to the present day, including ethics and theories of logic and epistemology. Certain elements of Stoic cosmology and ethics are seen in Christian doctrine. Stoics divide philosophy into three interrelated areas, physics, logic and ethics, all of which contribute to a person’s progress towards eudaimonia (a life of flourishing). The physics of Stoicism is based on the proposition that everything, including god, the mind, reason, and the soul, is matter, or that “nothing incorporeal exists.” This concept is based on two arguments: that the universe is one and therefore we cannot make a separation between the tangible and the intangible; and that since god and the world, body and soul act on each other (the body initiates thoughts in the soul and the soul initiates actions in the body), they must be of the same substance. At the most basic level the universe is constituted of an active principle, god, and a passive principle, matter. God, or logos, is the primordial fire that generates the four elements of air, fire, earth and water. Air and fire form an active rational force called breath (Greek pneuma, Latin spiritus), which acts on the more passive earth and water (physical matter). The two aspects interpenetrate each other, meaning that they both occupy the same space at the same time (crasis). The relationship between god and the world resembles the relationship between soul and body, with the soul as a fire that permeates the whole body. Since everything originates from god, or logos, the universe is imbued with divine reason, and therefore we see harmony, beauty and order in the natural world. The concept of pneuma was central to the Stoic theory of physics. The Stoics denied the existence of void in the cosmos and instead regarded the cosmos as a single, pneuma-charged organic entity. All natural substances were organized into a hierarchy of classes based on the activity and degree of organization of the pneuma. At the most basic level was hexis, the state of inanimate objects such as stone and metal, which are simply held together by their pneuma. Organic things, such as plants, which grow and reproduce but do not have cognitive power were said to have phusis as well as hexis. Animals, which had instincts, perception, impulses and a certain amount of cognition, were said to have psuche (soul) as well as phusis and hexis. The highest level of organization of the pneuma was the possession of reason (logos), especially characterized by the use of language. Only gods and humans possessed reason. Spiritual and intellectual qualities such as justice, righteousness and virtue were considered to be portions of pneuma. According to this view, all parts of the cosmos worked together for the benefit of the whole. Stoics believed that the universe moved through a never-ending cycle of phases, each developing according to a pre-ordained design and ending in a conflagration. The basic unit of Stoic logic was the simple proposition (axioma), a primary statement of truth or falsehood. Simple propositions could be combined into more complex conditional, conjunctive and disjunctive propositions. According to Stoicism, individual words had a corporeal existence, but propositions and concepts belonged to a class of incorporeals called lekta. According to the Stoics the use of language was closely connected with reason, and was one of the characteristics that set human beings apart from animals. A spoken sentence had three components: the object spoken of, the words of the sentence, and the meaning of those words (lekton). Stoics believed that the mind is like a blank slate at birth, and that all our cognitive experience comes through sensual experience. They developed an elaborate explanation of the way in which the mind receives and interprets sensory impressions and stores them as concepts or memories. A Stoic learned to examine sensory impressions and evaluate their truth or falsehood before accepting (assent) and responding to them. While the Epicureans believed that the most basic human impulse was the pursuit of pleasure, the Stoics identified the instinct for self-preservation and self-awareness as the “primary impulse.” This impulse came from Nature and could be seen in every newborn creature; it explained why animals instinctively knew how to behave. Human beings were initially motivated by this same primary impulse, but as they as they grew to adulthood they developed rationality and the notion of duty and virtue, which took precedence over self-preservation. As a person progressed in reason and virtue, he began to understand the value of other children, family, neighbors, members of the community and finally, all mankind, and to alter his actions accordingly. This process was called oikeiôsis, or the doctrine of appropriation. A wise person understood his role in the family and community, and acted to fulfill those roles. The eventual goal was to “live in accordance with nature,” or eudaimonia (a flourishing life). Only virtue was good, only vice was evil. Everything else, health, wealth, honor, sickness, poverty, death, was considered an “indifferent” (adiaphora). The possession of these indifferents was irrelevant to happiness, though some, such as health, were “preferred” and some, such as poverty, were “dispreferred.” These indifferents served as subject matter for the choices each person made from birth, with every correct choice being a step towards the goal of living in harmony with nature. There might be occasions when a person, guided by reason, might choose to sacrifice health or wealth for the sake of his role in the family or nation. Suffering and unhappiness resulted from passions, which were seen as mistakes in judgment and the erroneous assignment of value to something which was really an “indifferent.” Epictetus is quoted as saying, "When I see a man in a state of anxiety, I say, what can this man want? If he did not want something which is not in his power, how could he still be anxious?" A wise man using reason did not desire anything that was not in accord with Nature. The four types of passion were categorized as distress, fear, pleasure and appetite. The Stoics believed that the development of the universe was preordained by god, or divine will, and that man was therefore unable to affect the course of history by his actions. In his Discourses, Epitectus distinguished between “what is in our power” and “what is not in our power.” It is not in our power to change events, but it is in our power to change how we perceive and judge these events and their effect on our lives. True happiness could be achieved by learning to judge events from the point of view of Nature rather than an individual point of view. Early Stoics said that a person was either all virtue or all vice. They categorized four main types of virtue, wisdom (sophia), courage (andreia), justice (dikaiosyne), and temperance (sophrosyne), a classification derived from the teachings of Plato. A man possessing one of these virtues automatically possessed them all. True sages, or wise men, were very rare, and almost everyone could be considered a fool. Later Stoics softened this stance and placed greater emphasis on the process of becoming virtuous. Philosophy for a Stoic was not just a set of beliefs or ethical claims; it was a way of life involving constant practice and training (or askesis, from which the term ascetic derives). Stoic philosophical and spiritual practices included logic, Socratic dialogue and self-dialogue, contemplation of death, training attention to remain in the present moment (similar to some forms of Eastern meditation), and daily reflection on everyday problems and possible solutions. The Discourses and Handbook of Epitectus elaborated a system of mental exercises intended to develop the understanding of someone wishing to become a Stoic. Techniques like these continue to have value today in teaching how to overcome difficult circumstances and resolve conflicts. Although Stoicism was considered by many early Fathers of the Church to be a part of the philosophical decline of the ancient world, many of its elements were held in high esteem, in particular, the natural law, which is a major part of the Roman Catholic and early American doctrines of secular public morality. The central Stoic concept of logos became part of Christian thought (Christian Bible, John 1). The Stoic definition of virtue as the conformance of the will to the rational order of the world has parallels with traditional Christian morality. Long before Christianity, the Stoics taught that all human beings, including women and slaves, were of equal value, and put forth the concept of a worldwide brotherhood of mankind existing in harmony and peace. Stoic cosmopolitanism influenced Augustine of Hippo's concept of the City of God. Stoicism influenced the Christian Boethius in his Consolation of Philosophy, a book that promotes Christian morality via secular philosophy; this book was highly influential in the Middle Ages. "First, decide who you would be. Then, do what you must do." "When I see a man in a state of anxiety, I say, What can this man want? If he did not want something which is not in his power, how could he still be anxious?" "Freedom is secured not by the fulfilling of one's desires, but by the removal of desire." "Nothing outside the will can hinder or harm the will; it can only harm itself. If then we accept this, and, when things go amiss, are inclined to blame ourselves, remembering that judgment alone can disturb our peace and constancy, I swear to you by all the gods that we have made progress." "If you would not fail of what you seek, or incur what you shun, desire nothing that belongs to others; shun nothing that lies beyond your own control; otherwise you must necessarily be disappointed in what you seek, and incur what you shun." "In a word, neither death, nor exile, nor pain, nor anything of this kind, is the real cause of our doing or not doing any action, but our opinions and the decisions of our will." "Where is the good? In the will. Where is the evil? In the will. Where is neither of them? In those things which are independent of the will." "Who then is the invincible? It is he whom none of the things disturb which are independent of the will." "No man is free who is not master of himself." "Wherever I go it will be well with me, for it was well with me here, not on account of the place, but of my judgments which I shall carry away with me, for no one can deprive me of these; on the contrary, they alone are my property, and cannot be taken away, and to possess them suffices me wherever I am or whatever I do." "I am formed by nature for my own good: I am not formed for my own evil." "If, therefore, any be unhappy, let him remember that he is unhappy by reason of himself alone." "Every person must deal with each thing according to the opinion that he holds about it." "Permit nothing to cleave to you that is not your own; nothing to grow to you that may give you agony when it is torn away." "The universe is in change, life is an opinion." "Get rid of the judgement ... get rid of the 'I am hurt,' you are rid of the hurt itself." "The mind in itself wants nothing, unless it creates a want for itself; therefore it is both free from perturbation and unimpeded, if it does not perturb and impede itself." "Everything is right for me, which is right for you, O Universe. Nothing for me is too early or too late, which comes in due time for you. Everything is fruit to me which your seasons bring, O Nature. From you are all things, in you are all things, to you all things return." "Let there be freedom from perturbation with respect to the things which come from external causes, and in actions whose cause lies in yourself, be just; that is, let impulse and action terminate in social acts, for this is according to your nature." "If you are distressed by any external thing, it is not this thing which disturbs you, but your own judgment about it. And it is in your power to wipe out that judgment now." "Nothing happens to any man which he is not framed by nature to bear." "It is in our power to refrain from any opinion about things and not to be disturbed in our souls; for things in themselves have no natural power to force our judgments." "If you work at that which is before you, following right reason seriously, vigorously, calmly, without allowing anything else to distract you, but keeping your divine part pure, as if you were bound to give it back immediately; if you hold to this, expecting nothing, but satisfied to live now according to nature, speaking heroic truth in every word which you utter, you will live happy. And there is no man able to prevent this." "Everywhere and at all times it is in your power to accept reverently your present condition, to behave justly to those about you, and to exert your skill to control your thoughts, that nothing shall steal into them without being well examined." "How ridiculous and how strange to be surprised at anything which happens in life!" "Outward things cannot touch the soul, not in the least degree; nor have they admission to the soul, nor can they turn or move the soul; but the soul turns and moves itself alone." "The point is, not how long you live, but how nobly you live." "That which Fortune has not given, she cannot take away." "Let Nature deal with matter, which is her own, as she pleases; let us be cheerful and brave in the face of everything, reflecting that it is nothing of our own that perishes." "The soul should know whither it is going and whence it came, what is good for it and what is evil, what it seeks and what it avoids, and what is that Reason which distinguishes between the desirable and the undesirable, and thereby tames the madness of our desires and calms the violence of our fears." "Virtue is nothing else than right reason." Aurelius, Marcus. Meditations. Translated by Maxwell Stainforth, ISBN 0140441409; Gregory Hays translation, ISBN 0679642609. Hadas, Moses (ed.). 1961. Essential Works of Stoicism. New York: Bantam. Rassias, Vlassis G. 2001. Theois Syzen. Eisagoge ston Stoicismo. Athens. All links retrieved October 22, 2015. This page was last modified on 22 October 2015, at 15:43.